A 6,300-square-foot Tudor-style mansion on 1.26 landscaped acres of Cramer Point has sold for $5.5-million, thought to be a record amount for a Lake George residential property. “We’ve broken through the $3-million mark,” said Dan Davies of Davies-Davies & Associates Real Estate, listing agent for the property. He said he didn’t know of another sale that topped $5.5-million, and Chronicle archives show that it is the highest price paid in recent memory. The sellers were Robert and Christine Knarr. This Tudor mansion on Cramer Point sold for a record $5.5-million. The property features a carriage house, wine cellar, movie theater, boathouse and 645 feet of lakefront. Buyers’ agent Charlene Wood of Town & Country Properties and Estates said the $5.5-million sale price “was very reasonable based on what it was first listed for,” which was $7.995-million in 2013, according to MLS data. 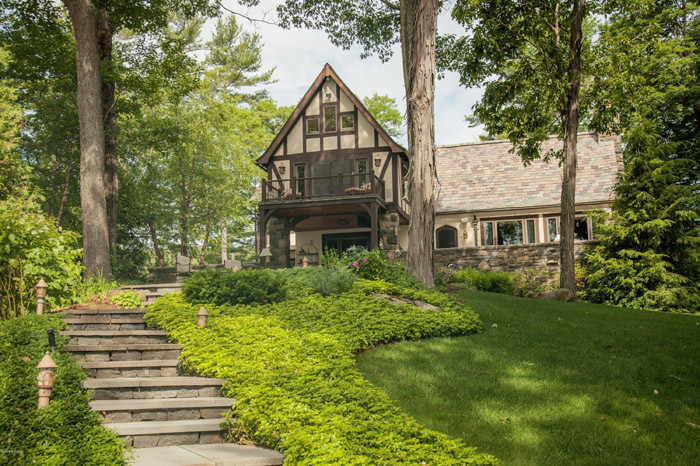 The March 29 sale of the Cramer Point estate comes four months after a 4,700-square-foot home on 8.22 acres on Lake George’s upper Northwest Bay in Bolton sold for $4.95-million. Lonnie Lawrence of the Sherwood Group was listing agent. Dan Collins of Select Sotheby’s International Realty was buyers’ agent. The $5.5-million sale tops the previous record of $5.485-million for a 20-acre property on Northwest Bay in Bolton sold in January 2006. A custom-made Green Harbour Lane home sold for $5.25-million in September 2011. It was listed in January for $7.9-million by Christine Marchesiello of Keller Williams Realty Capital District. She had not returned a message by press time.